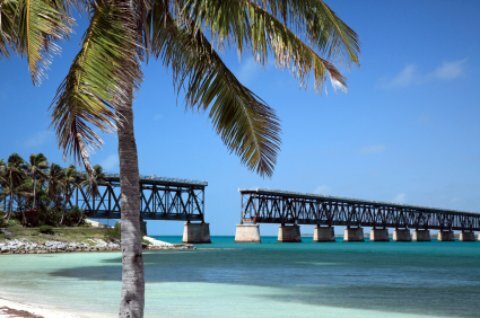 Bahia Honda State Park, located in the lower Florida Keys, is exceptionally beautiful and is a past winner of ‘best beaches’ and rightfully so. It is easy to get lost in the surreal beauty of Bahia Honda so close your mind to everything else and be happy you can enjoy nature’s glorious creation with sugary sand between your toes and a song in your heart. If working on your tan is on your agenda, there are several beaches in the area to do the job. So, "What is the best way to get a Florida tan?" "It all depends on your mood at the time," says Florida regulars with a smirk. Horizontally? (my way) If this is your mood, grab a lounge chair or spread a towel on a beautiful beach with white soft sand; read, sleep, eat, drink and tan away. Vertically? Get moving and get an all over tan; swim, splash, float, surf, scuba dive, snorkel, sail, rent a boat, fish, run, job, walk, pick up seashells, play volleyball or just go fly a kite! Choose both! From our experience, both ways work up an appetite for some fabulous Florida fish meals! Enjoy yourself! The snorkeling experience at this park is especially suitable for beginners because the water is shallow. The sea life is some of the best to be discovered in the Florida Keys. Hang around for a perfect and peaceful afternoon or rent a cabin and stay in paradise for as long as you please. One of the most amazing sites at the park is stumbling across butterfly or turtle breeding grounds. If you’re lucky, you may run into some of them. Butterflies and turtles are some of nature's oldest (and best designed) creatures so with any luck at all, you just might to get to observe them up close. However, keep your distance so you won’t scare them or interrupt their natural instincts. What to Do: Check out Strike Zone Charters for an affordable and unforgettable experience on the beautiful water. Where to Eat: There are a lot of great pizza places in the area, such as Big Pine Pizza, as well as several other restaurants. Where to Stay: If you want to extend your stay in paradise, renting a campsite or cabin is probably the best option but there are also hotels near by. For a peaceful, down-home experience, try Deer Run Bed & Breakfast or Big Pine Key Motel for an affordable and accommodating choice.